DTL’s 5th Annual ¡Celebrating Community! FUNdraiser at the LCC Center for Meeting and Learning was another outstanding success and raised a record $32,000 (net)! 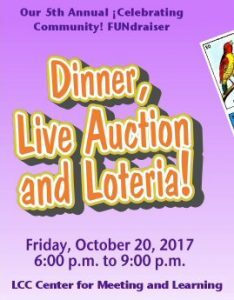 The evening featured a scrumptious plated dinner, live and silent auctions, dessert dash, and lotería. Honorary Chair Dr. Gustavo Balderas, guest speaker Guadalupe Quinn, our wonderful volunteer Gaby Nava-Cohen, and students Ericka and Olga inspired us with their personal stories and recognition of the unique role DTL plays in responding to the needs of our immigrant community and the challenges they face. Thank you to everyone who came out to celebrate our diverse community and the important work DTL does. Special thanks to our sponsors, table hosts, donors, volunteers, Sid and Hank Voorhees, and the board and event committee for your contributions and hard work. It was a joyful gathering of old and new friends! 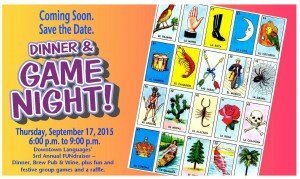 Dinner and Game Night, DTL’s fourth annual ¡Celebrating Community! FUNdraiser, at the Vets Club saw record attendance with upwards of 150 people! Zac and Valter’s music and Mayor-Elect Lucy Vinis’s opening remarks set the tone for the evening, and the sinuous dancing by Salseros Dance Group left everyone clamoring for more. The food was delicious, the games spirited, and the energy and good will of everyone in the room gratifying. Students Alejandro and Roberto and guest speaker Peter Chavannes of Petersen Barn Community Center inspired us with their stories, testifying to the importance of DTL’s programs for them personally and, on a broader scale, in creating opportunity for everyone in our community. Net proceeds from the event came to just under $18,000, which will help sustain DTL’s programs so that others like Alejandro and Roberto can learn English, complete their education, expand their opportunities for employment, develop leadership skills, and more fully participate in our civic and economic life. Sincere thanks to everyone who came and to our supporters who couldn’t come but generously gave, to our valued sponsors, staff, board, volunteers, and to our extraordinary students for making the evening a success. Check out Raúl and Alondra’s photos of the event. DTL’s Community Service Day, “Landscape and Language.” Hard-working volunteers from DTL, Rotary, Marist High School, and the Nobel Peace Laureate Project joined up with Eugene Outdoors for some serious weeding of the landscape beds in the Nobel Peace Park at Alton Baker Park. It was a fine Saturday morning until the thunderstorm arrived, but we kept at it and made some real progress. It was fun to meet new people and hear about their interests. 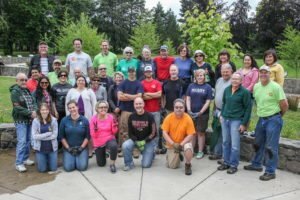 Many thanks to Katie Blair-Terrazo of Eugene Outdoors for her leadership. We’re ready to do it again next year! Oakshire Inspires! – $1 a Pint. Oakshire Brewing donated $1 for every pint sold all day to Downtown Languages. We raised $310 (apparently, everyone was thirsty). THANK YOU to all our friends and families who came out to support DTL, and a special thank you to Oakshire Brewing for their gift and for hosting this fun event. 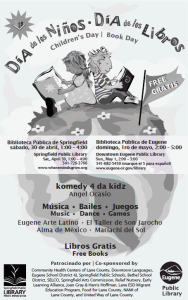 Día de los Niños / Día de los Libros—Saturday, April 30, at Springfield Public Library. Sunday, May 1, at Eugene Public Library. Día de los Niños / Día de los Libros (Children’s Day / Book Day) is an international holiday honoring children, culture, and books. 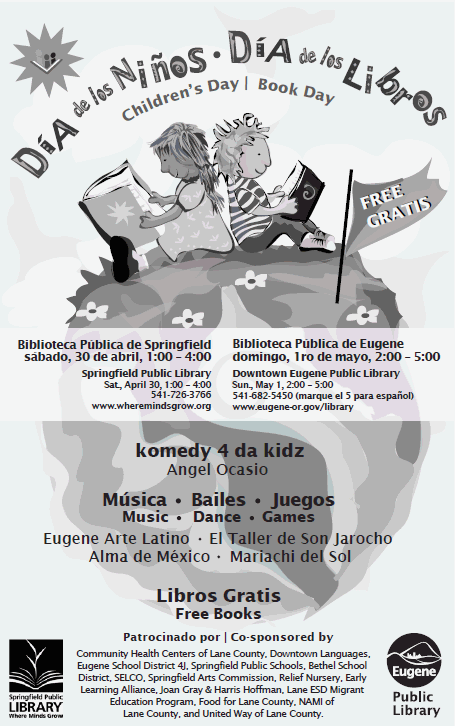 Local families are invited to celebrate at a bilingual festival including comedy, live music and dance, hands-on arts activities, games, library card sign-ups, refreshments, and free books for kids to take home. Join in the fun at Springfield Public Library on Saturday, April 30, 1:00 to 4:00 p.m., and at Eugene Public Library on Sunday, May 1, 2:00 to 5:00 p.m. Admission is free. Diviértete en el Día de los Niños / Día de los Libros (Children’s Day / Book Day), una fiesta internacional que celebra niños, culturas, y libros para toda la familia. El festival bilingüe de todo un fin de semana incluye cuentos, música, bailes en vivo, actividades creativas, carnetización e inscripciones para poder usar la biblioteca, refrigerios, y regalos de libros para niños. La entrada es gratis. Benefit Day at Falling Sky Brewing. 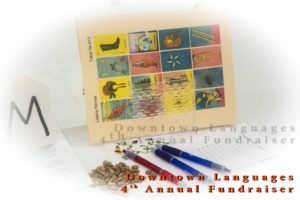 Falling Sky donated 25% of all sales all day to Downtown Languages. We had a good turnout and raised just over $305! Thanks to all who came out to the Brewpub and the Deli, and a big THANK YOU to Falling Sky for their generosity and support of literacy in Lane County. Dinner and Game Night, our third annual ¡Celebrating Community! FUNdraiser, at Sprout! Regional Food Hub was a lot of fun and a great success. We netted just over $10,000, and were pleased to see a lot of new faces in the crowd. Game masters Dave and Jimbo of Star Productions did a fine job of MCing and running the games, and our speakers Coco and Julian brought the house down! Thanks to everyone for coming, for supporting Downtown Languages, and for spreading the word. Our friend and photographer Raùl has posted photos of the event on his FaceBook page Latino Lane County. Check them out. 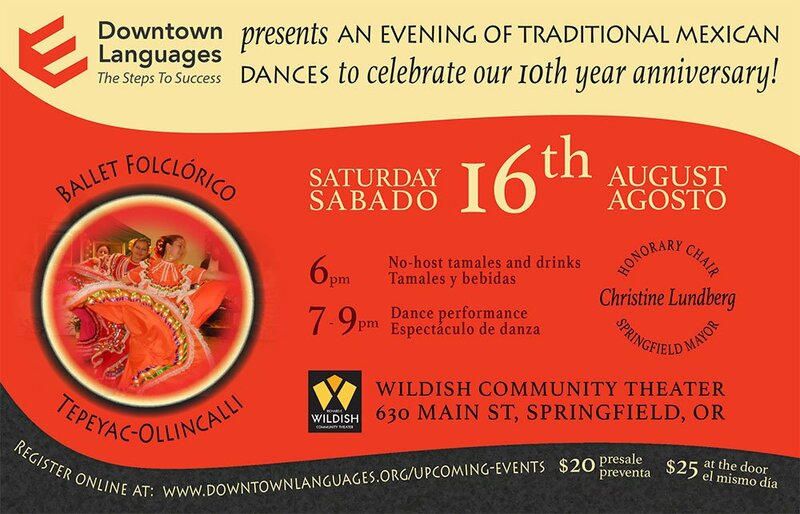 10th Anniversary Celebration with Ballet Folclórico / Tepeyac-Olincalli, Saturday, August 16, 2014, 6:00 p.m. – 9:00 p.m., at the Wildish Theater, 630 Main Street, Springfield, Oregon. 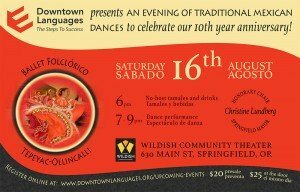 Please join Honorary Chair Springfield Mayor Christine Lundberg and Downtown Languages for our 10th anniversary celebration! Come enjoy an evening of camaraderie and a wonderful program of Pre-Hispanic and Mexican Folk Dance by this talented Tepeyac-Olincalli Ballet Folclórico group from Vancouver, Washington. Fun for all ages! We hope to see you there. ¡Celebrating Community! 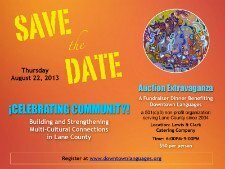 Auction Extravaganza, Thursday, August 22, 2013, 6:00 p.m. – 9:00 p.m. A gala dinner, program, and fundraising event at Lewis and Clark Catering Company, 2210 Martin Luther King Jr. Blvd, Eugene 97401. What a fun summer evening it was! The evening grossed just over $19,000 and netted just under $13,000! Thank you all so very much for coming, for supporting our organization, for celebrating community, and for your generosity! The proceeds are making a huge difference in the programs we are offering this fall in both Springfield and Bethel. There are now about 50 families participating in Pilas! Family Literacy.